We are fortunate to live in an area surrounded by pine trees. My boys love to be outside, exploring the ground for plants, trees, and even weeds. Our nature hikes can lead to hours of activity and fun for our family. This post is part of a group of posts being put together by bloggers with the Kid Blogger Network. This ABC’s of nature series is being hosted by School Time Snippets. Every day a new and awesome blogger will share a letter of the alphabet and great ideas to go along with it. If you’d like to learn more, stop by the ABC’s of Nature homepage over at School Time Snippets to read all about Kristina’s vision for the series and check out where all the letters can be found. 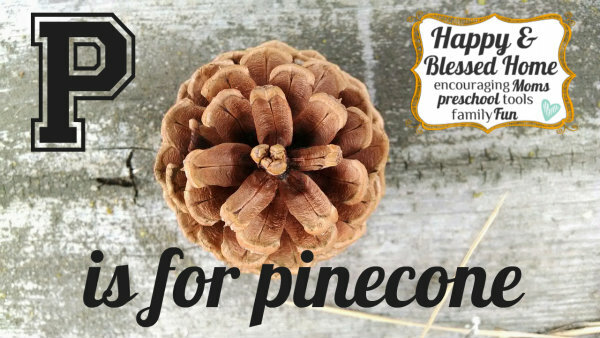 And if you’d like some lesson ideas for teaching your children about pinecones, you’ll love the nature-inspired lesson I’ve written about below. A wonderful activity that can easily be facilitated with young children is a scavenger hunt. All you have to do is make a list of four or five things that you would like your children to find and ask them to collect the items. Since we’re surrounded by pine trees, we can easily spend half a day collecting pinecones. 1. Appearance – The male and female pinecones look different. In the photo below you can see the male pinecone. The soft orangish-brown “leaves” at the center look like tiny soft caterpillars. These are actually male pinecones made up of tiny pollen sacks. In this photo the sacks are empty and the tree-tip has broken off and fallen to the forest floor. 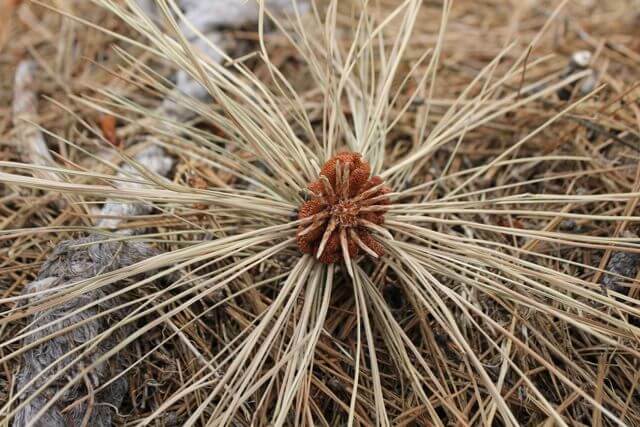 In this photo you will see an example of the female pinecone. The female pinecone houses the seeds. 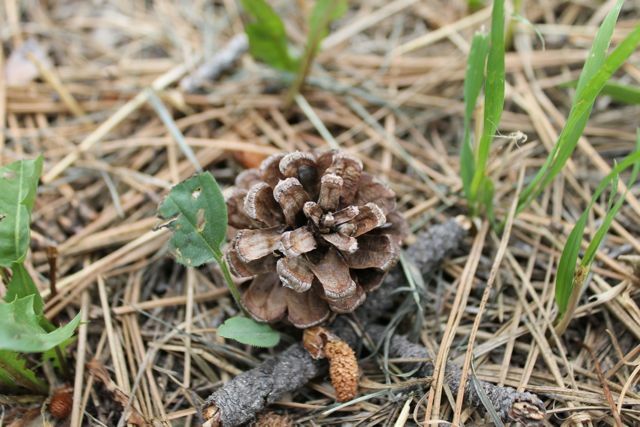 A tiny male pinecone lies at the base of this female pinecone. In order for the seeds to become fertilized, the male pinecone has to release pollen into the air to pollinate the female pinecones. 5. 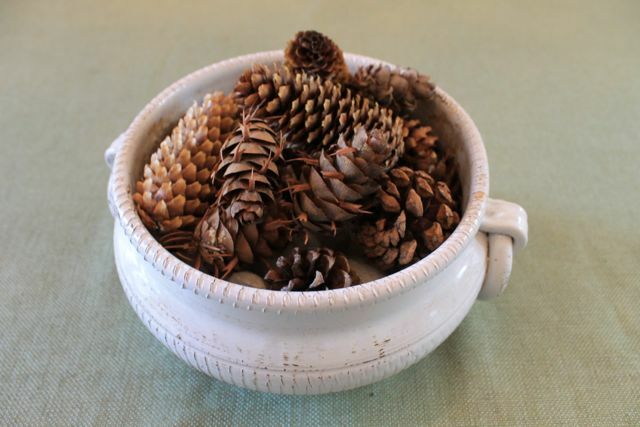 Popular Crafts – Culturally, pinecones are often used to create crafts. A more popular craft is the pine-cone cow. This is a pine cone with sticks inserted between the scales to create legs. I’ve attached some FREE downloadable pinecone coloring sheets. You can print these coloring sheets on construction paper, break apart a pinecone and glue pieces of it to the paper. Or you can print the image on card stock and paint some beautifully colored pinecones. 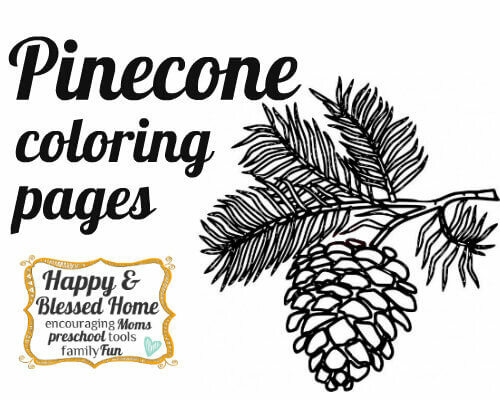 Just click the image to download your free pinecone coloring pages. 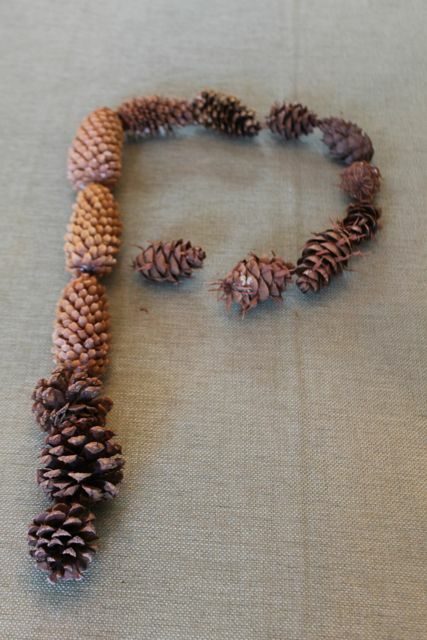 We used our pinecones to create the letter “P” and we gathered them together to make a nature-inspired centerpiece. Our eat-in breakfast area pinecone centerpiece. My boys love to be in our backyard experiencing the great outdoors. I hope these pinecone ideas inspire you. What outdoor activities are you enjoying with your children? I’d love to hear from you in the comments. If you like my blog please like my Facebook page at: HappyAndBlessedHome – thanks so much! Likers get 50 free prayer cards for moms. Just click on the “Just for Likers” symbol on my FB fan page. Silly me– I had no clue there were male and female pinecones! We have a few pine trees nearby and the kiddos enjoy collecting them! Thanks for sharing some interesting facts!